Humberto, a.k.a. Pepe, was born and raised on the beautiful island of Cuba. From the time he was 8 years old he loved to dive. Surrounded by the ocean he decided to make a career out of diving. He is an SDI and ACUC Instructor Trainer. Humberto Lazcano Owner and Head Instructor at Adventure Divers is the proud recepient of SDI's prestigous 2012 and 2013 "Outstanding Instructor Award". Humberto is a proud husband and father of two children. His son Alex is a certified SDI Advanced Diver who loves to go diving with his dad and help out in the store whenever he can. His daughter Rocio recently completed her SDI Jr. Open Water Diver Course. 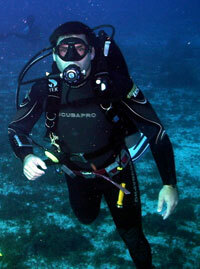 Together with his wife Sherry, they own and operate Adventure Divers. Humberto has a wealth of experience and information to share with all of his dive students. Humberto has a passion for diving and the patience to teach anyone.